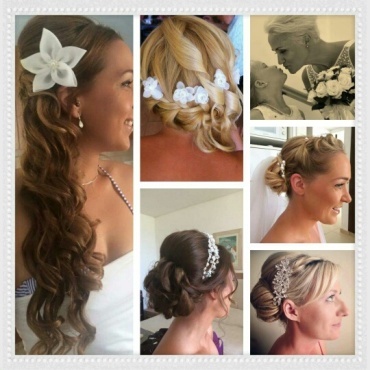 Another bride’s dilemma is......what style to have your hair on your wedding day? My biggest tip for your wedding hair (if you have long hair), would be to have it in an “up do” or a “half up/ half down do”, so it is off/away from your face, as much as possible. This will keep you cool in the Cyprus heat, plus your hair will not then be blowing around in the breeze (if you are lucky enough to get some breeze) and be getting in your way whilst you are having your photos. You want to be picture perfect and having your hair blowing around is not going to give you your perfect pictures, plus you also don’t have to worry or fuss with it throughout the day. Another little tip is that you could incorporate a little of your bouquet flowers into your hair, nothing says destination, romantic wedding hair more than a few flowers, and, it also ties in with your decoration/ theme for the day too. We recommend the ladies at Bliss Salon, we have worked along side them now for many years and they always do a fantastic job and all our brides come away very happy, every time (just take a look at some of their reviews on their facebook page). They have their own salon locally or they will come to you (if allowed by the hotel). Please see a sample of some of their work in the pictures.